For comfort and ease when you are running, walking, training or working at your workplace is the first thing to consider for all of us. To make sure you stay fatigue-free while pin and needles are not allowed to attack your feet from the inside of your shoe, you have to take care when getting the best training shoe or walking shoe on the market. Though there are a number of options for you to get one, you must be familiar with preferable features to make you feel comfortable and relaxed as well as active all the time you wear those pair of shoes. This New Balance Men’s training shoe has some of the most desired features one may have to look for and we have described it for you below. The finely sewn components of the upper synthetic leather top consist of well-adjusted patched of durable and high-quality leather joined together to make it easier and breathable. The shoe is designed so that it would not tear off easily and can cope with frequent usage. The EVA footbed insole is made of high-quality, soft yet supportive padding. It supports the heel, the mid-foot, and the toe box in a way that keeps the foot in its natural posture and would not leave it imbalanced causing fatigue or pressure points. The outsole is made of durable rubber that is crafted to give full grip on any kind of surface you are training or walking on. The flexible and durable no-mark rubber offer sufficient support and make sure to keep you safe from slipping or tripping on the ground. The shoe has IMEVA supported midsole that ensures easy and comfortable footrest using the high-end ABZORB cushioning that keeps the foot easy and relaxed. The ABZORB technology assures that the pressure on the foot is lowered as the impactful forces are absorbed easily before reaching the foot. The shoe comes up with the lace vamp designed to give maximum adjustability so that the shoe fits snug with the foot. The neck collar and the heavy padded tongue offers comfort, support, and ease of use as well as the mesh fabric lining offer breathability and slip-free inner fit. With the 10 mm drop and 2-inch shaft from the arch, the shoe is perfect for heavy trainers and frequent walkers. The shoe consists of all imported USA made components so they provide a durable finish for better and long lasting performance. You can wear the shoe for training sessions, at work or while walking. It supports all kinds of activities when you have lots of pressure on your foot. The shoe is capable of providing a safe and continuous support for your foot as having the ABZORB technology and EVA footbed, your foot will not be affected by external pressure and bumps hence your foot and leg muscles will stay easy and relaxed and may provide hours of performance without getting fatigued. The high-quality leather and mesh materials provide a durable shoe that is not affected by early wear and tear issue that are common in other shoes of the same kind. The shoe sole is made up of quality rubber that offers stability over a wide range of surface and keeps you safe from getting slipped. It also offers a no-marking feature that ensures your shoe will not affect the training surface if you are training in the wooden or shiny court area. The mesh lining keeps the foot fresh and free from sweating issues that also adds up to the benefit of the shoe as you will feel comfortable while having a cool and dry feeling when you are training hard. You may have to order a bit larger size if your feet are bulky and need bigger toe box. It may not fit well if you get the exact size and have a heavy foot structure. It is better to get a wider shoe from the selection. Sometimes if you have a heavy body or have lots of training sessions, you may feel the sole not so durable or may not cope with intense workout having lots of impact on your feet. As this shoe has most of the features people usually are looking for in a training shoe including the durability, comfort, and shock absorption, this has been trusted and used by thousands of customers online. It has been given approximately 4.4 out of stars rating on various stores selling this training shoe. For sure you can also expect to get high performance and better results if you are able to find the best fit for yourself using the given sizes. Though mist customers recommend half or one size bigger for bulky feet. 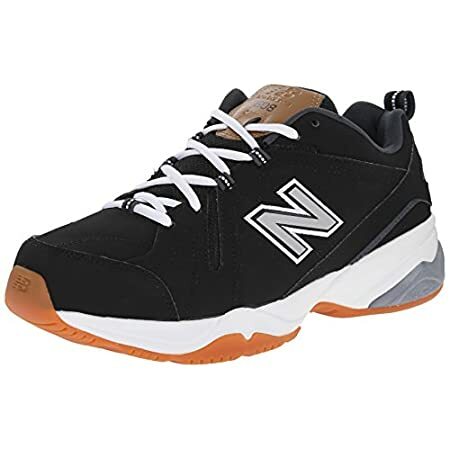 Overall this New Balance Men’s training shoe is perfect for training sessions and regular walk. To make sure the foot stays in its best posture and relaxed condition, the EVA footbed supports and caters to all comfort needs of the wearer. The breathable inner and fully padded collar make sure your foot stays fitted yet comfortable in the shoe. You can use it with confidence on any kind of surface as it would grip on the ground perfectly and leaves no marks on the plain court floors. It can be a long-lasting option for those who are looking for a durable training shoe having all the essential features to ease the walking and all kinds of foot moves.